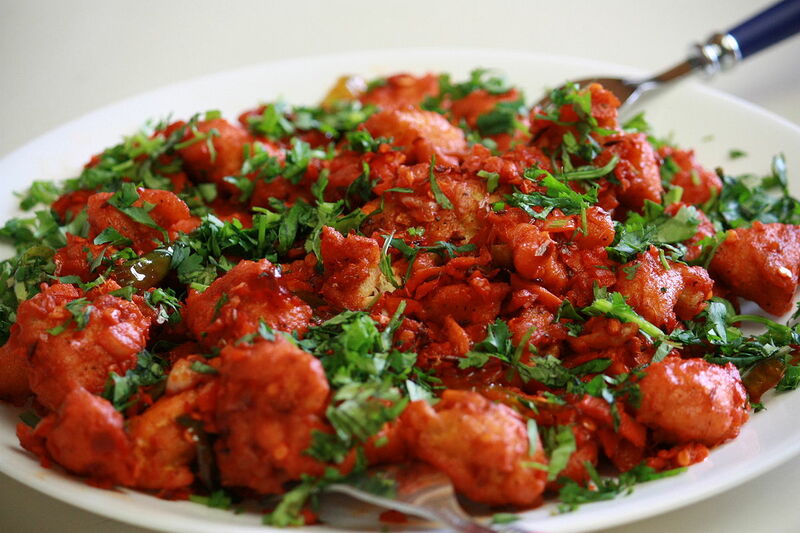 Chicken 65 – Delicious deep fried chicken marinated in yoghurt along with assorted herbs and spices and tempered with red chilies, mustard seeds and fresh curry leaves – I am sure this description is enough to make you crave for this awesome starter. You can use substitute lemon juice with vinegar to make the chicken tangier. Also, for coloring the dish bright you can use beetroot instead of edible red colour. Grind Chilies, Ginger, Garlic, Coriander seeds, pepper corns etc to a fine paste. Mix the yogurt, lemon juice, grated beetroot or colour (if using), rice flour, salt and two tablespoons oil into the ground masala paste. Mix in about 10 Curry leaves as well. Coat the chicken with the paste just made and marinate for an hour. Heat the remaining oil in a thick-bottomed pan. Start by adding the chicken pieces in small batches of six to eight pieces and stir-fry over high heat for a minute or two. Toss continuously. Add another batch of the chicken and repeat, be sure to continue tossing the chicken and not let it burn or stick to the pan. Lower heat once all the chicken has been added. Turn the pieces frequently, coating with the remaining masala. Cook till the chicken turns crispy on the outside, but moist and soft on the inside. Do not over cook. Adjust salt, add the remaining curry leaves toss well and remove. Garnish with fresh coriander and serve hot. The mildly spicy chicken 65 is usually served as a bar snack, an entree or an appetizer. Serve with a wedge of lemon and raw onion rings. “Chicken 65 (Dish)” by Amiyashrivastava – This photo was taken in Boise on 8 July 2012 when we prepared Chicken 65 for us. Licensed under CC BY-SA 3.0 via Wikimedia Commons. Recipe says pepper corns, you didn’t use them though, am guessing they go in the marinade once powdered.